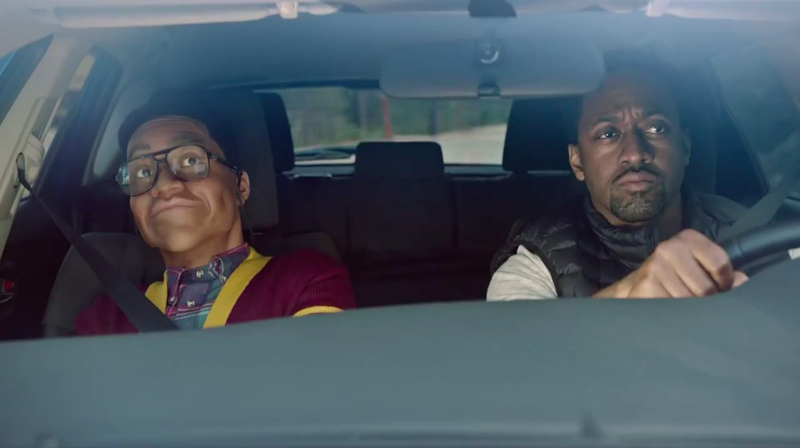 Droga5 delivers two of the year's most entertaining celebrity endorsements, as James Franco and Jaleel White ride with their alter egos—the former paired with his artsy side, the latter with a wax figure of Steve Urkel—in a big new campaign for Scion. The spots, directed by Smuggler's Randy Krallman and targeting millennials, are self-consciously quirky and very well constructed, as they poke light fun at the actors' personas. Along with a third spot starring an inflatable tubeman from a car dealership, the work launches Scion's new iM and the iA models. The theme is "Weird, right?" and the spots lean into the idea of weirdness as a hallmark of the brand's drivers, who want to stand out from the crowd, as well as the nameplate itself. "Scion and Scion drivers have always been great at embracing their own weirdness," Droga5 executive creative director Neil Heymann tells Adweek. "Scion does things their own way, in spite of what people expect from a car brand. What's new here is the way we're expressing this—with the launch if the iM and the iA, we wanted to balance that weird heritage with a value message." The White spot is particularly inspired, finding very amusing ways to use the wax-museum Urkel to show off the car's features. The Franco spot is solid, too, with just the right amount of mild disdain in the voiceover to appeal to Franco detractors while still letting Franco be the hero—he's squarely in on the joke, of course. "Very few celebrities are known for making diverse and unexpected career choices the way that James Franco is," Heymann said. "He's someone who uses his star power to try his hand at all kinds of interesting things, including appearing in car commercials. And we think people will love seeing Steve Urkel and Jaleel White hanging out together on their screens and having some fun with their relationship." He added: "Both actors were chosen based on their place in pop culture, and fortunately they felt the same way about this as we did and had a great sense of humor about it." Two more spots are expected in the coming months. With this work, Scion is targeting 18- to 34-year-olds, many of whom are seeking their first new car, said Nancy Inouye, the Toyota brand's national marketing and communications manager. "They are looking for premium features, great design, safety, high mpg and a value price … all of which the iM and iA deliver," she said. "The iM and iA are designed for people who want to stand out from the crowd, and we think the fun commercials and the 'Weird, right?' tagline, which speaks to Scion vehicles that include premium features that actually come standard, will appeal to their desire to be different." Inouye wouldn't divulge the media spend behind the new campaign, but said "we will have unique integrations with ESPN and Jimmy Kimmel, as well as advertise on top-rated network shows and high-profile sporting events. In addition, we will be advertising in over 1,600 cinemas nationwide between now and mid-October." Droga5, which has been introducing Toyota's fuel cell-powered FCV to the world, picked ip creative duties for Scion in earlier this year. "Jaleel and Wax Museum Urkel"
"Recently Liberated Car Dealership Tubeman"